I know that the ‘A‘ in GLASS stands for Apache, but I have to admit that since last spring, I have been using lighttpd almost exclusively for my performance tests. It all started last fall, when I noticed that every once in a while, I’d get some pretty noticeable flat spots in the performance graphs when running at rates in excess of 100 requests per second. 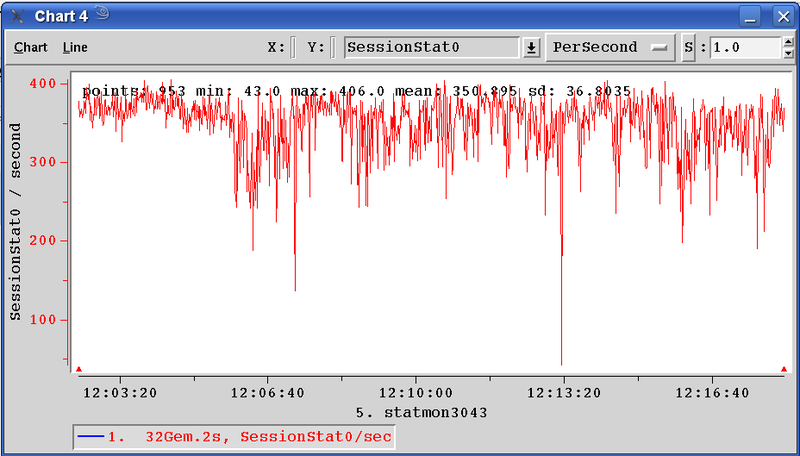 You can easily see the flat spots in the graph at right (running this setup – 4 gems on a 4 core machine with 10 concurrent siege sessions). Peaking at 200 requests/second, but the graph has big swings. I originally blamed the the flat spots on “contention,” but I didn’t know where the flat spots were coming from. In May I started tracking down the source of those flat spots. Over a several days of testing I was able to rule out disk I/O, network I/O, and GemStone internals as the source of the contention. All vital signs on all of the systems involved were flatlined – I used separate machines for siege, Apache, and GLASS. I finally got around to using tcpdump and I was able to see that the last packet to flow between machines before the flat spot was an HTTP request packet heading into the Apache box. The flat spot ended with a packet heading from the Apache box to the Gemstone box. Pretty clear evidence that Apache was the culprit. Without getting into the internals of Apache, I figured that the contention must be an unfortunate interaction between the MPM worker module (which is multi-threaded) and mod_fastcgi. 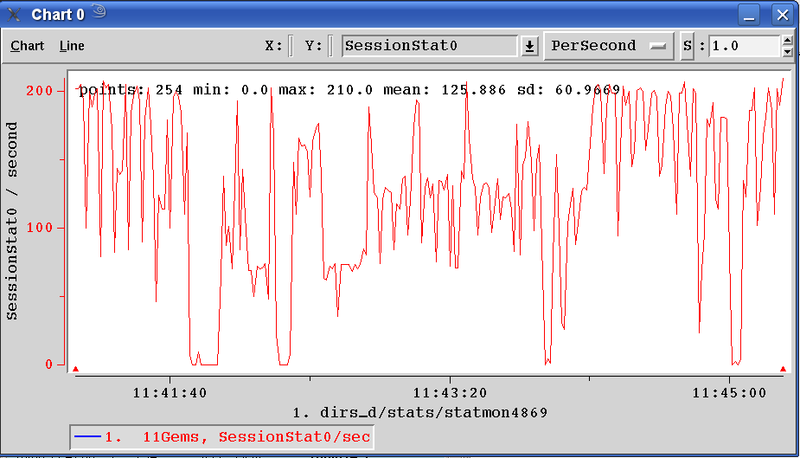 I asked our IT guys to install lighttpd and you can see the results in the graph at right (32 gems on an 8 core machine with 180 concurrent siege sessions). In this run we’re peaking at 400 requests/second (twice as many cores), but the performance graph is much tighter (standard deviation of 36 for lighttpd versus 60 with Apache) and best of all, no flat spots. Soooo, if you expect to be hitting rates above 100 requests/second, you should be using lighttpd. Not only is lighttpd performant, but it is pretty easy to setup as well. It turns out that Miguel Cobá has just published a post on ‘Gemstone/S and FastCGI with lighttpd‘ where he describes how to set up lighttpd for GLASS. Photo: Grandpa’s Shed, Uploaded by a o k on 3 Apr 07, 11.14PM PDT. For the last month or so since the International Smalltalk Developers Conference, I have been busy working on the Single Session per VM project trying to get to the point were I can validate the approach. It was straightforward to make the necessary changes to Seaside, but I literally spent more time trying to figure out how to get session affinity to work with FastCGI in lighttpd. Once I had the basic prototype working I needed to really hammer the server, but neither siege nor jcrawler does a good enough job (siege doesn’t crawl a site and jcrawler sends concurrent requests for the same Seaside session) so I started work on a Seaside-aware load testing tool called scrawler. Scrawler needs a a real good HTTP client and the HTTP client (HyHTTPClient) in the latest version of Hyper from Bruce Badger is perfect – which explains why I was porting the latest versions of Sport and Hyper to GLASS last week. Over the weekend Dario Trussardi reported a problem with MAFileDescription which turned into Bug39648 and a few other GemStone-specific issues related to MAExternalFile model. By Monday, I’d resolved Dario’s problem and I figured what the heck, while I was in the neighborhood I might as well merge in the latest Magritte code from Lukas. And while I’m merging code from Lukas, I might as well pick up the latest code for Scriptaculous and Pier. The ink wasn’t even dry on my Pier merge, when I received mail from Doru, announcing Pier 1.0.17. Talk about synchronicity. Had events (spanning the globe) been conspiring all month long to converge at this moment in time?….Nope, but we do have a pending final release for GemStone/S 64 version 2.3, so I got my giddy up on and updated to Pier 1.0.17. Pier-Design-tg.5, Pier-Documents-lr.7, Pier-Google-lr.5, Pier-LightBox-dc.6, Pier-Randomizer-lr.4, Pier-TagCloud-lr.11, Pier-Titles-tg.1, Pier-Twitter-lr.7 Pier-Setup-tg.30 to conform with Pier 1.0.17. Bug39648 – FileDirectory>>forceNewFileNamed: doesn’t ensure creation of subdirectories. Bug39357 – appliance 1.0 beta10 gems get commit conflicts on first startup. Bug39413 – ‘Magritte implements #description: which interferes with subclass creation’. fixed duration string generation (RSRSS2) from Philippe Marschall. MAFileDescription upload problem reported by Dario Trussardi. The first expression picks up some new initialization code and the second expression installs Pier 1.0.17 as a Seaside application. In GemStone-obi.293 Gerhard Obermann changed the layout of the Transcript Window to allow more buttons, added a Find Substring button, and arranaged for SHIFT-click on the Debug button to empty the Object Log. Personally, I’ve moved to this version of the Squeak client as I think it is an improvement. If you are running in 2.3 beta 2 or 1.0beta10 then you only need to load GemStone-obi.293 into your Squeak client, save the Squeak image and you are done. Download the single-click Squeak client for 2.2 (download) from GLASS downloads and then load GemStone-obi.293. RECOMMENDED. start the Squeak client image. save the image and exit. copy (or use a symbolic link) the GCI library (location in top pane of the Login Window) to a file named gciForLinux.so, gciForMacintosh.so or gciForWindows.dll, depending upon your client platform. restart the image and log in to GLASS. Keep an eye out for the announcement of the final release of GemStone/S 64 version 2.3 [update 10-25-2008] which should be coming soon. Read James’s blog for the full scoop on his tour of User Groups in the Midwest (Columbus Ruby Brigade, Object Technology User’s Group, Detroit Metro Ruby Meetup, Agile Round Table, and Ohio, Indiana, Northern Kentucky PHP Users Group). At times a few seemed to be paying more attention to their iPhones or laptops than to me, but I discovered later at the social hour that they were Twittering about the possibility of using Seaside on an existing project. If you are interested in having a GLASS presentation at your user’s group, please send email to James dot Foster at GemStone dot com. James has a post and a couple of screencasts on getting GLASS running on Slicehost. Visit his blog for more details.